Sat., May 12, 2018, 6:11 p.m.
It’s not just a matter of how much land we’re going to lose, though the barrier islands and low-lying communities will be largely uninhabitable once the ocean rises by 3 feet. It’s a matter of what can be saved. And elsewhere, how we’re going to manage the retreat. Flooding also is increasing in South Florida’s western communities – like Miami-Dade’s Sweetwater and The Acreage in Palm Beach County – because seawater is pushing inward through our porous limestone foundation and upward into our aged flood control systems, diminishing capacity. Sawgrass Mills in western Broward closed for three days last year because the region’s stormwater system couldn’t handle a heavy afternoon thunderstorm. You’ve never seen that before. The encroaching sea is bringing sea critters, too. Catfish were spotted swimming through floodwater at a Pompano Beach apartment complex west of I-95 last year. And don’t forget the octopus that bubbled up through a stormwater drain in a Miami parking garage. More than the rest of the country, South Floridians get it. The Yale Climate Opinion Maps show 75 percent of us believe global warming is happening, even if we don’t all agree on the cause. We understand that when water gets hotter, it expands. And warmer waters are melting the ice sheets in Greenland and Antarctica. If all of Greenland’s ice were to melt – and make no mistake, it’s melting at an increasing clip – scientists say ocean waters could rise 20 feet. The problem is, we’re not convinced sea-level rise will harm us in our lifetimes. We’ve got to change that mindset because it already is. Like most of us, Doris Edelman of Hollywood hadn’t heard of king tides five years ago. Now she can’t leave her house those autumn days when king tides lift the Intracoastal Waterway over its banks, over her street and halfway up her driveway. Hers is not an isolated case. Yet government officials see the danger ahead. South Florida’s four counties have created a climate compact that, among many things, requires new construction to anticipate that minimal 2-foot rise in water levels by 2060. However, sea-level rise is not yet on the short-term horizons of the mortgage and insurance industries. Perhaps that’s because lenders generally recoup their money within 10 years and insurers can cancel your policy year to year. Perhaps you think you’re safe because the flood map shows your home is on high ground. But you still need infrastructure – things like roads, power plants, water treatment facilities, airports and drinking-water wellfields. So while your house may be high and dry, good luck getting to the grocery store, the doctor’s office or out of town. At the federal level, little leadership is being shown on the threat of sea-level rise. President Trump recently rolled back the Obama-era order that requires infrastructure projects, like roads and bridges, be designed to survive rising sea levels. 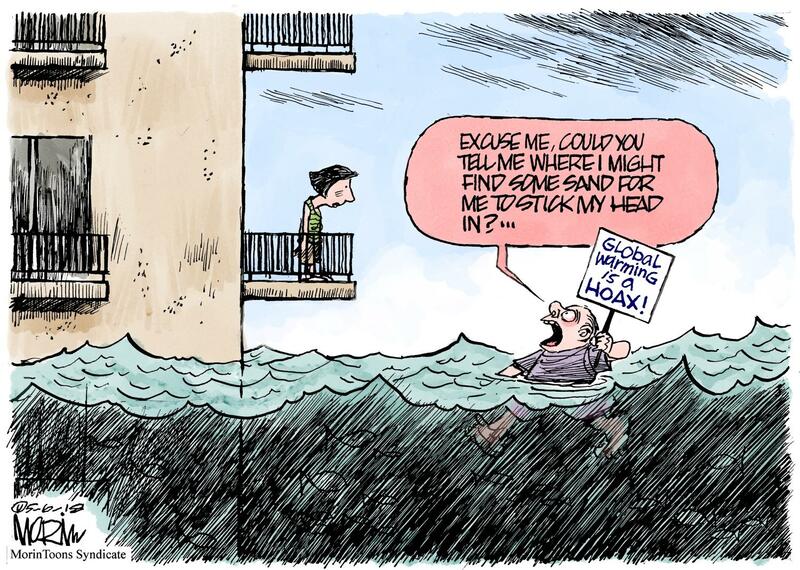 And though membership is growing in Congress’ Climate Solutions Caucus, too many Republican members still deny the reality of climate change and sea-level rise, perhaps fearing political retribution by right-wing deniers. U.S. Sen. Marco Rubio resides in that camp. In Tallahassee, after years of silence on sea-level rise, Gov. Rick Scott this year finally requested $3.6 million – a pittance, really – to help local governments plan. But despite the efforts of some South Florida lawmakers, the issue wasn’t on the Legislature’s agenda, partly because of the politics of climate change and partly because term limits create a revolving door of lawmakers who focus on today’s hot buttons, not tomorrow’s existential threats. To that end, the editorial boards of the South Florida Sun Sentinel, Miami Herald and Palm Beach Post – with reporting help from WLRN radio – are joining hands in an unprecedented collaboration this election year to raise awareness about the threat facing South Florida from sea-level rise. In drumbeat fashion, we plan to inform, engage, provoke and build momentum to address the slow-motion tidal wave coming our way. Published: May 12, 2018, 6:11 p.m.